If you've signed up for an online streaming package with Netflix, we'd love to know how it was for you, so we can improve the guide. Click reply to leave your feedback. Last edited by Former MSE Becca; 15-02-2013 at 12:34 PM. I've just signed up to Netflix via Quidco (£15 cash back). I'm watching on a Mac, which so far seems OK. Occasionally the picture freezes for a few seconds but it's not that much of a pain. Sign up was really easy - I did it via Facebook and was registered in seconds. I then just needed to download and install Silverlight to start watching. Apart from the cash back, I signed up because I really wanted to watch Dexter - only the first 2 seasons are available though, which seems to be the case with many of the TV programmes. I'll feed back again once I've explored the site a bit more and watched some other stuff. Really impressed with the picture, no buffering. I only joined for the cashback but thought I'd check out the picture quality, might have to keep it now. Happy to have programmes with no adverts. I had the free trial but cancelled because the films were so old. Was going to go to Lovefilm instead as they had a better selection online, however on joining their free trial hardly anything is available on the ipad which is what I use to view so have cancelled that also. Netflix was very good quality and no issues with buffering even though we only have 1.5 mb broadband. Lovefilm was unwatchable at this speed. I watched 3 seasons of Private practice on netflix and if they get more up to date films I woud definitely join up again. Signed up last week with Quidco (£15 cashback offer) and currently streaming the films etc via our Wii and iPads. The streaming is great, no buffering or breaking up. Signed up not only because of the offer but wanted to try something other than lovefilm. I agree with other posters with regards to content, the films are old ones and the tv programmes aren't really what we watch. We was hoping for the series 2 and a half men to be on there, we've yet to see the show in order on sky and it was a slow process using lovefilm. Not sure if I will keep the subscription going when the free trial ends but would definitely keep it if it had the newest films and a bigger library of tv shows. I signed up via TCB on saturday and have watched a few films with my family, some are old but i haven't seen them so have enjoyed my sub so far. I had issues with streaming on the Wii initially but changed the video format in my account to turn the HD off and its been great ever since. At the moment i'm getting paid to watch films I never got round to or re watch stuff so no downside here. I joined Netflix for the £15 cashback offer and was just going to watch my 5 and a half hours and take the cash. However I might keep it now as a lot of the stuff on there is interesting to me, and if I use it the £5.99 a month is worth it. I like watching older movies and American TV shows, which means it suits me. I watch through the PS3, and have had no buffering issues at all. I did have Lovefilm a few months ago but felt their selection for streaming on the PS3 was very poor, so much prefer Netflix. Not the greatest service I've used! Quality is good - no problem at all with buffering. However, the films are old. As an example, there are only 4 seasons of 24. My original intention was to actually continue this membership and not cancel. I will probably be cancelling before the 1 month free trial simply because I have seen everything I wanted (and I don't watch netflix everyday!). The childrens films/program choices are rubbish. The other comment I made to Netflix was that they don't have a queuing mechanism where you can bookmark films you are interested in watching - and then use your device to go through the queue. Surprised that they didn't invest in some time to do some competitor analysis before launching in the UK. Unless they can add more recent films - I cannot see this service beating Lovefilm. I also found the search facility on the WII to be difficult to use (being a techie - this was concerning) - they should take notes from BBC iplayer! content isnt all that current. though I quite enjoy the older stuff and still finds films I havent seen. Yes, I've said this too. I'd like to bookmark things as I am browsing. I signed up last night for the topcashback, because my teenager wanted to watch anime in his room on his PS3 and I didn't know my husband's password. I don't know if the cashback will track due to us having 2 accounts at the same address (but for 2 different adults, so we'll see), but it gave me a free trial anyway. The streaming has been fine. We have watched on a wii and a Ps3. Have not tried watching on the computer yet. Hi all, Please note, any posts that include individual referral links will be removed by the Forum Team when reported. Please keep this forum thread for just discussing online movie streaming services. Last edited by Former MSE Andrea; 08-02-2012 at 9:57 AM. I've just signed up using TCB and using my wii, so fast so good, all running ok and everything is streaming fine no buffering issues, it's a shame that love film does not let you steam to a wii otherwise we would have kept our account open with them, but for £17 free you can't complain. Are you able to download movies to watch offline like you can with BBC iPlayer? I don't mean download to keep but download to watch in the next few days. Thank you Martin for having a completely complex system of tqists and turns. The very first time I take your advise I get nothing. Well done. In your email it states. 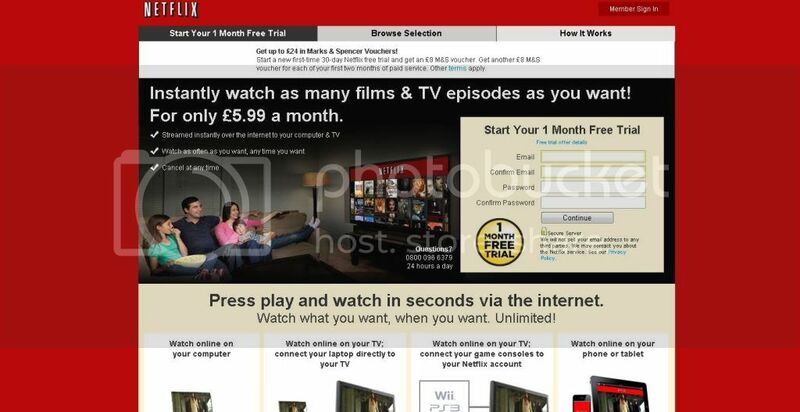 Use this free Netflix* 30-day trial link we've blagged for MoneySavers and you get an £8 M&S voucher. So stupidly I click the link and register with Netflix - do I get a voucher NO! Apparently I was supposed to ignore that link and click some link called quidco. Well here is a concept, put that in the first link so I click that. OMG that makes sense doesnt it! Last edited by custardy; 08-02-2012 at 12:29 PM. I had Lovefilm for a short while but cancelled due to non arrival of a number of discs. I'm glad I did because Netflix is ten times better. For the same price (£5.99 a month) I get unlimited viewing of a good comprehensive library of movies which are being added to daily. The streaming quality is excellent with no blips at all. It is truly unlimited also, including many films in HD quality. If you have a TV connected via HDMI to your computer (not difficult to do) then this is definitely the best deal arround. I'm very pleased with it and have decided to continue my subscription after the free month. The movies also play extremely well on my Android phone making it very portable. No more messing around with discs for me, or paying as you go, which works out far more expensive. I have to admit to being in a bit of a quandary with my Netflix subscription. I'm currently a basic package Lovefilm subscriber (2 Blu-rays a month for £4.07), I really like the Netflix interface and the fact that the movies are streamed in HD. It also works really well on my iPhone over Wifi and 3G (thanks to 3's All You Can Eat data package). However I don't think I can justify spending £5.99 a month for Netflix and £4.07 for Lovefilm's postal services. I could upgrade to Lovefilm's £7.99 a month service which includes streaming movies, but their interface isn't as good, they don't stream in HD and it won't work on my iPhone. Free trial - yes, I love it, no problems. Worth £5.99 a month? No. Not current enough films for me. Did see it as a way of getting more content into this house above what we get on freesat, but there really isn't much on there we're interested in. Free trial - yes, I love it, no problems. Worth £5.99 a month? No. Not current enough films for me. I agree. I signed up yesterday following the tip-off from the MSE weekly email. It works well but I was shocked at how few films there are, of any vintage (1960s - 2011), whereas LoveFilm (DVDs by post) did tend to have 90% of all DVDs I ever searched for. I suggest that Netflix should have built up a much larger database before launching in the UK.